You know how I mentioned that we’d been traveling and that my body is craving fruits and vegetables? And you know how I mentioned that I was really, really hungry for raspberries? Try as I might, I can’t find one decent raspberry in all of York, Nebraska. Correction: I can find a decent raspberry. But they are either in a package that also contains moldy raspberries, or they are in a teeny-tiny container that costs $3.48. As much as I’m craving raspberries – for that price, I just can’t do it. Elias (our 12 year old) and I drove to our two grocery stores today, after striking out at Wal-Mart last night, on a mission to find raspberries. I guess it just isn’t meant to be. Maybe in a few days, after stores re-stock and sale prices re-set??? In the meantime, as the boys and I were unloading our other groceries and talking about all the goodies I bought yesterday on our way back into town, it occurred to me that while I don’t have any raspberries, I do have pretty much everything else delicious under the sun. I shall whine no more. 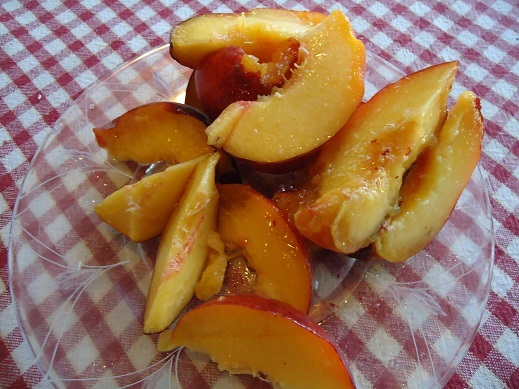 We’ve found great deals on tons of summer produce, loaded up our kitchen once again with wonderful fruits and vegetables – and we are enjoying all kinds of deliciousness. Everything but raspberries? Well, I am just all kinds of blessed. 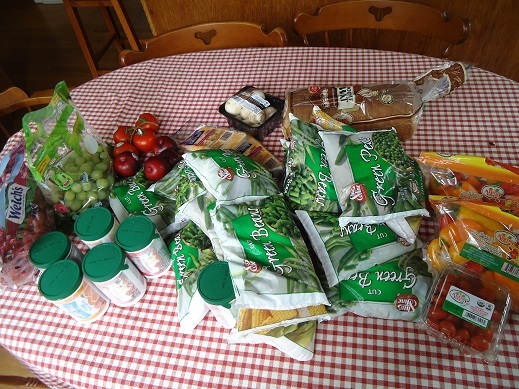 Grapes were on sale, plums were on sale, there were organic tomatoes and mushrooms to be had – and look at all those bags of frozen veggies! Those babies were on sale for just 80¢ each! We filled the cart…as you can see. :) 100% juice was on sale, so we stocked up so that we can make fun popsicles the rest of the summer. 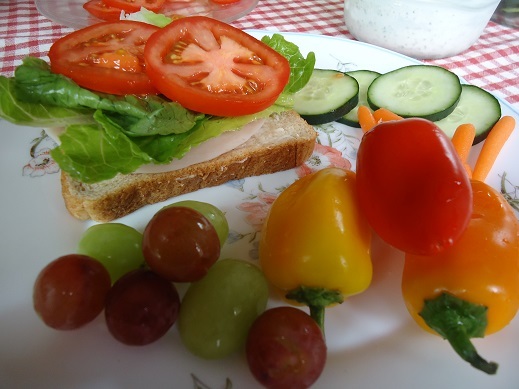 We grabbed sweet peppers and splurged on a loaf of bread so we could have an easy meal of sandwiches for lunch. Everything but raspberries? Blessed, blessed, blessed. 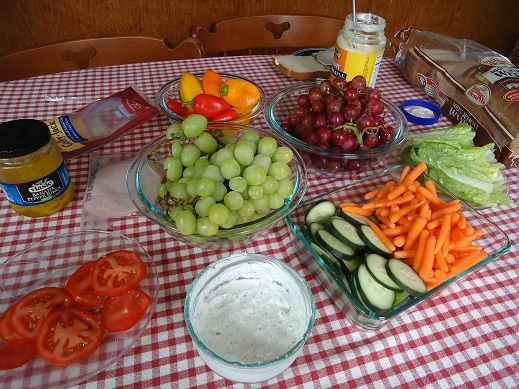 We got home from the store and set out this wonderful spread of food. After traveling and eating fast food, I can’t begin to tell you how delicious this all tasted. Oh beautiful, colorful, delicious plate. God is so good. What’s more? 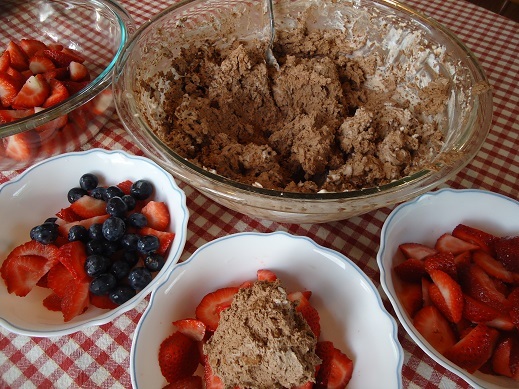 For breakfast we had big bowls of berries with Chocolate Whipped Cream. It was a perfect way to begin our day. 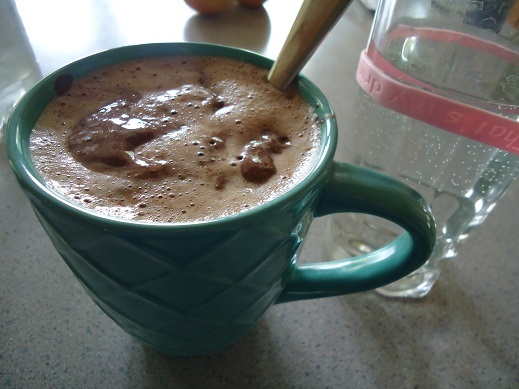 Well, I actually started my day with an awesome cup of coffee, too. :) Asa brought back a bag of coffee for me from Ecuador. Oh my goodness: best coffee EVER. 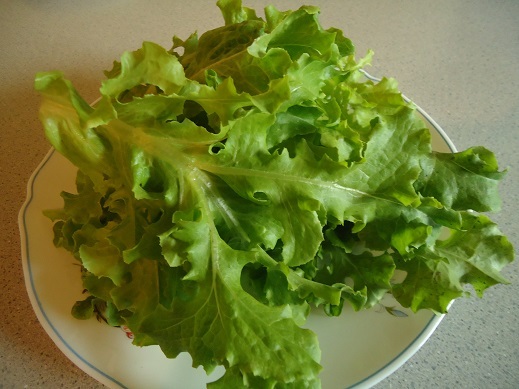 This afternoon, Matt went to the garden and brought in a plate full of awesome lettuce. Remember how I shared that a big hail storm took out our garden a few weeks ago? Many of you suggested that it might perk back up. You were right! Much of our garden has bounced back. We are so thankful! 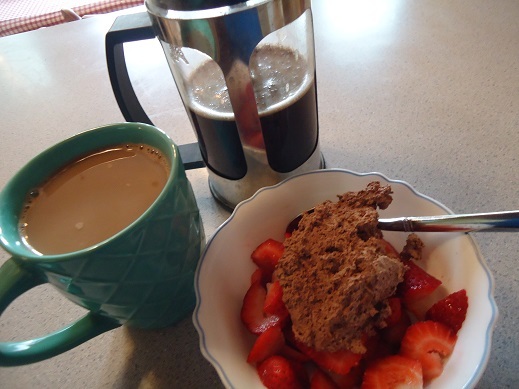 This afternoon, I enjoyed a generous serving of Chocolate Whipped Cream in a cup of coffee. Happiness in a mug, I tell ya. 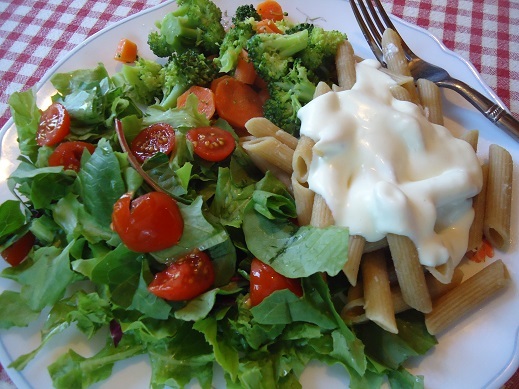 We thoroughly enjoyed the lettuce from our garden with our dinner of Pasta Alfredo with steamed veggies tonight. So what’s all this about wanting raspberries? We are so blessed with an abundance of delicious foods that I have absolutely nothing to complain about and absolutely everything to be thankful for. I’m sure I’ll find a nice package of raspberries for a decent price eventually. Maybe I’ll even find some fresh berries at the farmer’s market this week. But no matter. Today, my table is overflowing with goodness. I have everything I need and then some. What are you thankful for? Leave a comment to let us know something God has done for you recently! Those “??? ?”‘s are supposed to be a smiley face! God continues to bless our family! We are military and are in the middle of a PCS (Permanent Change of Station – moving to a new post). We signed a pre- lease for a home on our new post on June 3 with a possible move in date of July 17 – after the time that my husband would start working at his new job. Our family would be separated for a few weeks while we waited for our home to be ready. Last Monday, God provided a temporary place for us to stay as a family (the mission house of a local church). We were thrilled that we wouldn’t be separated. Then on Tuesday, God provided us with a home on our new post, a month before we expected it – we sign the lease tomorrow! To top it off, our HHG (HouseHold Goods) will be delivered this coming Saturday! We are so thankful for the goodness of our great God and praise His name for all He has done for our family! I am thankful for what we have and how we can use what we have. Fourteen years ago God blessed us with a share of a vacation house and I am so thankful for that. We had $6500 in an account toward a lake house and so I prayed and asked for that money to go far toward our dream. Two weeks later God answered our prayer with a 1/12 share of a house on a nearby lake for only $6250! Our children grew up going to that house four times a year and now my husband and I are so thankful for a place to go and unwind and sleep, sleep, sleep! I have just never gotten over how God blessed us and gave us that house! Raspberries never get to less than $2 for a tiny 6 ounce package here in the south. When I was a child we lived in Iowa and had a large patch of raspberries. We would just stand out there in the yard and stuff ourselves everyday! We had such an abundance that our parents never restricted us on eating them. I have such fond memories of those times. Thankful my daughter gets to spend this week at camp as a jr camp counselor. Its a blessing to watch her grow with God guidance. I also thankful that God as lead us to the direction of homeschooling and online. Never thought I would be homeschooling. I am very thankful for the babe in my belly (daughter #5 coming in August) and I’m grateful that, in spite of my doubt, God provides enough financially each month. I was so thankful and ecstatic to find raspberries at my grocery store yesterday for 1.99! You just need to come to Branson again. ;) Also thankful for my recent blessing of raw mlk for $3/gal just 40 minutes from my house….and a group of friends willling to take turns driving to pick it up for everyone! I’m thankful for your encouraging blog and posts to help me fight the good fight of helping my family eat well. I’m also thankful for the handfuls of ripe raspberries that we’ve been picking and eating for the last week, just outside our back kitchen door. Hopefully with a few more weeks to come : ) . I’m thrilled that your garden is bouncing back! What an answer to prayer. I am thankful today for the same thing you are. I am thankful that we may not be able to purchase all of our desires, but we have never known hunger. It’s interesting that we focus on the things we want (I’m really wanting your coffee!) rather than what we have. When we change our perspective to one of utter gratitude, it changes everything, doesn’t it? Thank you, again, for this great reminder of how blessed we truly are! You need to PLANT raspberries, honey! That is where our stash is coming from right now. Straight off the vine! Perennials. They come back & grow more every year. We haven’t had success with blueberries, but raspberries & blackberries — yes! We are south of St. Louis, so maybe they would grow well in your area too? Can’t say that I’m with ya on the raspberry raving, but all the rest sounds great! This brings up all sorts of gratitude :) I am so thankful that we got to take a nice, long family camping trip to Utah. Bryce and Zion were AMAZING!!! Thankful for the way that God is working in my marriage, and for the lessons that He is teaching me in the process. I am thankful for the full-sized violin that God put right in front of me at a garage sale (for a whopping $45!!!!!) It is a nice instrument and the almost-12-year-old daughter is thrilled. Now she accepts that God wants her to play. Sometimes God just needs to hit me over the head for me to get it!!!!!!! Also thankful for the sister that didn’t have a birthday present for said daughter and bought most of it!!!!!! YAY GOD!!!! !